It has not been a good year for US retail giant Forever21. The trendy chain store found itself in hot water earlier in the year for a leaked company memo that indicated the ‘slashing’ of work hours and health care benefits for all retail employees. More recently, Forever21 came under fire on Twitter for releasing a new line of t-shirts that many felt were racist due to their slogans, among which were the statements ‘City of Compton’ and ‘Ice Cube’. The models wearing the t-shirts, being Caucasian, sparked further outrage from their followers, and the brand promptly took the t-shirts off their website. It seems that casual racism in their products has once again flown under the radar for the retail store. 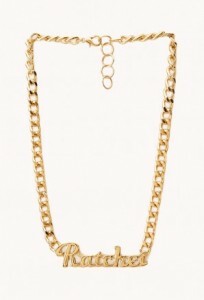 They have recently designed a so-called “street-chic” necklace featuring the word ‘ratchet’, which has a similar meaning to the word ‘ghetto’, used as ‘the go to word for all things gaudy’. Forever21 has, again, brought to light the question of what exactly is racist, and when has a brand gone too far? While the word isn’t exactly a racial slur, the context in which Forever21 is using it to market their jewellery is questionable. One article begs the question: ‘Can we really blame them, though?’ Sure, celebrities like Beyoncé and Lady Gaga may have sported the word, possibly making it more widely acceptable to be used in everyday conversation. But the issue here is where to draw the line. If Forever21 makes it okay to use ratchet to describe someone or something, how long before they’re painting a much deeper and convoluted picture of race perception with their clothing and products? I can already imagine the ‘too sensitive’ and ‘it’s just a piece of jewellery’ comments that litter Facebook and other websites in the face of these issues. But this is what spurs retail giants into making products like the ratchet necklace. The casual sense with which people of all ages make racial comments, without even realising the intention or the pain behind the words, is worrying to say the least. I frequently have to stop myself from firing up at a friend’s use of certain words that, whether they know it or not, have a plainly racist history behind them. While I personally find it disgusting to use such words in every day conversation, I know so many who have no problem saying it, most worryingly as a joke, too. It just brings to light the ignorance with which people operate, and I wonder, if they knew where certain words came from, and the connotation they imply, whether or not they would actually be using them at all. By rejecting that this necklace is in any way insulting, we are perpetuating the cycle of denial, particularly in first world countries, when it comes to racism. We are permitting the next generation to use words like this, not knowing where they come from or what they truly mean. We – and by this I include retail stores like American Apparel and Forever21 – should be educating the younger generation on the use of words like ‘ratchet’, and on the intelligent ways to conduct a conversation: without racism. I completely agree, Matilda. It’s a tough thing to navigate, I think. Like you, I frequently have to stop myself from raising the issue with people around me. When I do choose to bring it up (which is probably more rarely than I should), people usually claim that they weren’t using it in *that* sense, because *they’re* not racist/sexist/etc. The other day, an acquaintance used the word “Abo” to describe Aboriginal Australians, and when I stopped him, he tried to argue that it was “just a contraction of ‘Aboriginal’”. I brought up the point that it is a historically and culturally loaded word, and that, even if he says he is not racist, the word itself is. After a few minutes, I felt like I was talking to a wall though, especially when he gave a nominal apology to, in effect, shut me up. I just felt like saying, ‘don’t apologise to me – apologise to Aboriginal Australians’. It’s a hard subject to bring up, though, because people often become defensive and take my points personally, rather than as a commentary on the use of words in today’s society more generally. This is probably why I don’t bring it up as often as I should. The problem is, these things get under our skin if we don’t pay close enough attention to them. Next thing you know, our children are using them, and the whole history of racism against certain groups of people becomes forgotten or normalised, rather than existing to remind us to stop acting that way, now *and* in the future. This entry was posted in Culture, News, Opinion and tagged Culture, fashion, Forever21, racism, ratchet. Bookmark the permalink.